4K Ultra HD is finally affordable—here are the best 4K TVs of 2019. Buying a new TV can easily become overwhelming. Manufacturers throw an awful lot of jargon into the equipment specifications, intentionally trying to confuse consumers into buying the latest model. The newest features sound dazzling—but what do all those terms even mean? The manufacturers won’t tell you, but we will. Our team at CableTV.com researched the latest TV technology to determine which features are worthwhile and which ones are just gimmicks. We’ll dive into the details below, but here’s the bottom line: 4K is fantastic, affordable, and finally worth it. It lives up to the hype. If you’re in the market for a new TV (or a projector), you’ll regret not investing in a 4K model. Screen Size Up to 140"
Before we give you the lowdown on the winners, we’ll cover a few considerations you should keep in mind when choosing a 4K TV. We’ll also give you recommendations on which piece of equipment to pick based on your priorities, whether you care about price, advanced features, or finally being able to show off a super-sized screen to your friends. 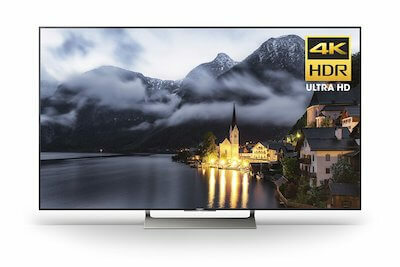 What should I consider when choosing a 4K Ultra HDTV? What is the difference between 4K Ultra HD and Ultra HD? First off, know that 4K refers to the resolution the screen can display, and the difference between 4K Ultra HD and regular HD is monumental. There’s no question there. But the difference between 4K Ultra HD and Ultra HD is a lot smaller, which is why you’ll often see 4K and Ultra HD used interchangeably. 4K refers to the cinema-standard resolution, and Ultra HD is associated with the consumer derivative of that. It’s a small variation, as you can see from the numbers below. A model identified as a 4K Ultra HDTV is one that meets both the specifications listed below. Experts agree that HDR has even more potential than 4K to radically transform picture quality. If you can afford the hefty initial investment, we recommend HDR because it’s the future of TV. HDR (high dynamic range) refers to how colors are displayed, not the resolution. HDR technology allows for a truer color contrast and rendition of blacks. In some cases, HDR standards are powered by Dolby Vision technology, which is considered superior to other forms of HDR but is limited in its availability. Basically, if you’re into experiencing every nuance of your entertainment with things like the Marvel Universe (and who isn’t? ), HDR may be the ticket to finding your superhero TV. If you can afford it, go with OLED—but that’s probably a pretty big “if.” While prices for 4K have descended from the stratosphere of most-coveted technology, OLED (organic light-emitting diode) prices are still soaring high. So, why do we think it’s worth shelling out some extra dough? Most affordable 4K TV models are currently using LED (light-emitting diode) technology, and the ones on our list are exclusively backlit. That means every one of those eight million pixels are illuminated by LEDs that run along the back of the TV unit in long strips. This system still utilizes good old-fashioned LCD screens but changes the way they are lit or the configuration of the LEDs, which is actually some pretty ancient technology. In contrast, OLEDs create pixels that are individually illuminated—every single one. The difference in color quality is so startling that you’ll be salivating after the first minute of viewing. But there’s a catch, and it’s in your wallet. The good news is that OLED prices are dropping every year as manufacturers refine processes and start looking at the next big thing in screen tech, like quantum dots. 4K Ultra HD is a license to overindulge when it comes to screen size. We recommend a 52-inch screen for a viewing distance of a mere 7 feet, so even small rooms can be dominated by your enormous TV without seeming ostentatious. 4K TVs are backward-compatible, meaning they still work with your older TV equipment, including DVRs. But you won’t get the full resolution you paid for if you use old devices. To ensure you’ll see all the details on your brand-spanking-new 4K Ultra HDTV, utilize 4K-compatible devices like the Roku 4, Hopper 3, Genie HR54, and others. You’ll also want to make sure your HDMI cable supports 4K. 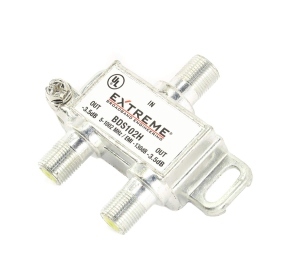 It probably does, so it’s likely unnecessary to buy a new (and overpriced) specialty cable, but it’s best to double-check before you invite the neighborhood over for movie night. If you don’t have many HD channels with your TV package, you may want to change that before you buy a 4K TV. 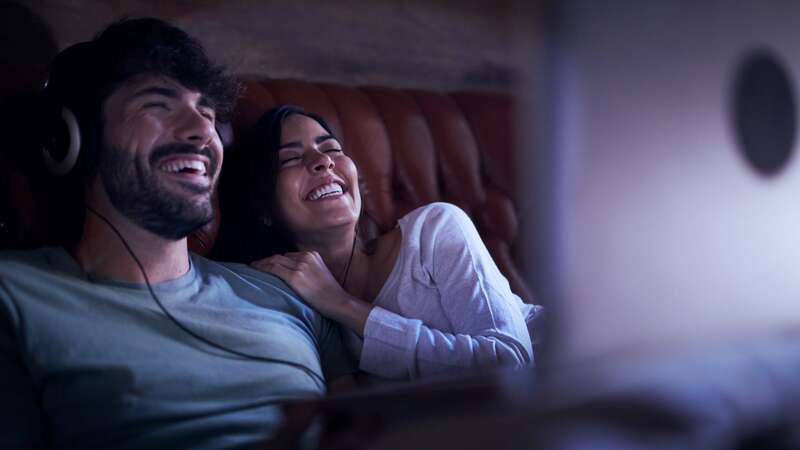 Check out our guide to the best HDTV packages or enter your zip code below to see what plans are available where you live. 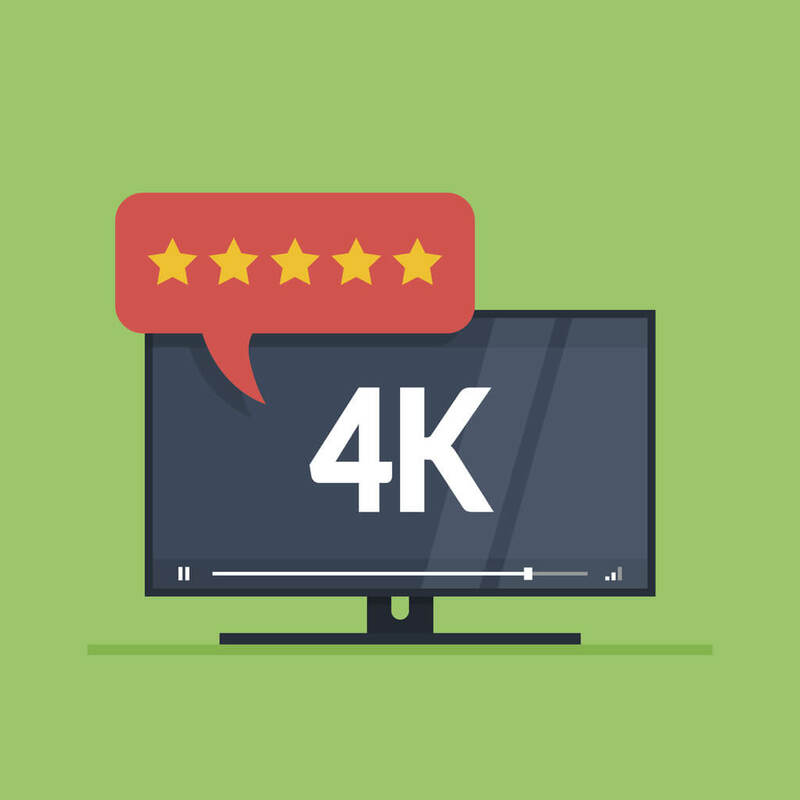 For more information on where to get the best 4K content for your TV, check out our guide to watching 4K in 2019. Make sure the TV you choose has the necessary ports to power connection to devices like your home theater, DVR, external hard drives, and more. If you have an older DVR or dated audio equipment and don’t plan on upgrading, you may want to pay close attention to compatibility issues in the specs. If you’re streaming 4K content, all that lovely high-resolution programming is going to take some extra data muscle, so make sure your internet speed is up to the task. Not sure how much speed your connected household requires to keep up with your new technology? Use HighSpeedInternet.com’s speed tool to find out. 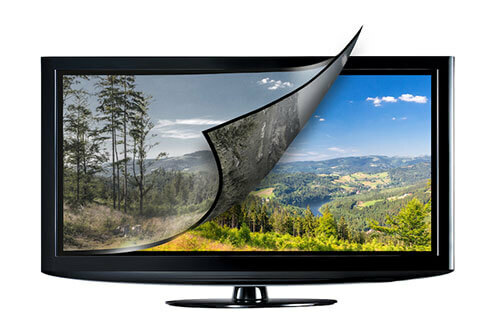 OLED and HDR technology inflate the costs of 4K TVs, but the prices will come down eventually. Don’t ditch your current TV if you’re happy with it, but now is the time to invest in 4K if you’re already in the market for a new TV. Current prices will continue to fall in the wake of the debut of 2019 models. Refresh Rate—This is how fast a screen refreshes. It’s important for action-driven programming, especially sports. However, consumer agencies indicate many of these specs are inaccurately measured. Most modern TVS will be in the neighborhood of 120–240 Hz, and that’ll do just fine. 3D—This was a big thing a few years back, but it’s largely a gimmick, and the quality was never that great. Our advice? Steer clear. 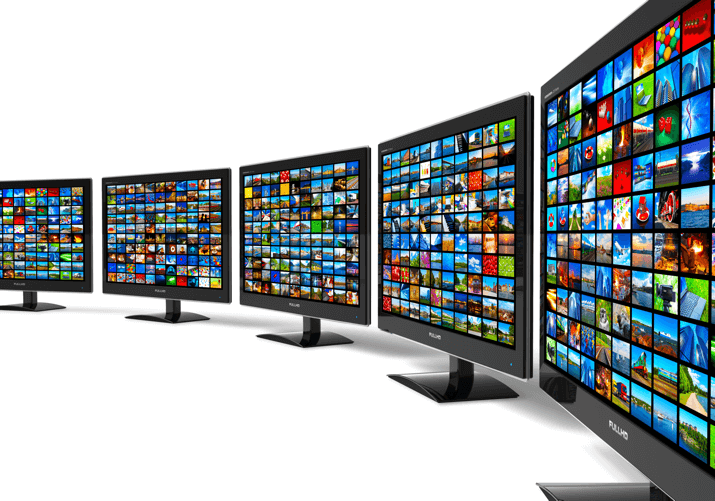 Smart TV— If your favorite TV is a smart TV, great, but don’t let that determine your decision. Smart TVs can connect to the internet and your various streaming services with a handy built-in interface—but you don’t need a smart TV to get smart features. Almost any TV can be turned into a “smart TV” by plugging in a Roku or Fire TV, and streaming tools typically have better user interfaces anyway. Curved Screens—Curved screens that promise to improve viewing from any angle are another gimmick that was all the rage a few years ago. As you might expect, all they’re really doing is slightly distorting the picture. Give these a pass. For a more complete explanation of the various specifications and features you’ll see on TVs, use our TV buyers guide to learn more. Is there any 4K HD programming available to watch? Why, yes, there is 4K content to watch. We wouldn’t define it as “plentiful” quite yet, but the available Ultra HD content is definitely growing. It certainly makes sense to have a 4K TV if you already have one of the streaming services or TV providers that offer 4K content. Now onto the important questions, like which one of these marvels of modern technology is coming home with you? For the best overall combination of picture quality and price, we like this 65-inch model from Sony. It’s not OLED, but the LED picture is still incredibly crisp and clear and features HDR support for enhanced image quality. It’s almost all screen, which makes for a great look with the screen on or off. You also get a built-in Android TV system to handle your streaming services and apps along with Amazon Alexa voice control. That’s a lot of features for its relatively low price tag. 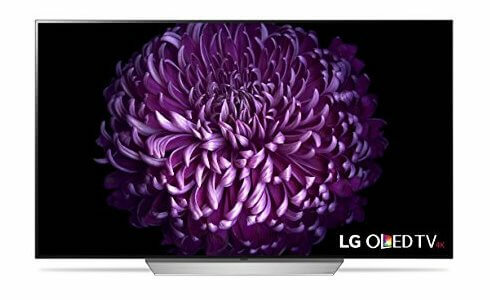 If you want the best picture possible in a TV right now, LG OLED TVs are where it’s at. The C7P produces an absolutely breathtaking 65-inch picture, with the infinite contrast of OLED combining with HDR to make images vivid and lifelike. It also features Dolby Atmos support for pristine surround sound. All of this comes at a high price, but if picture quality is your number-one concern, you’ll be hard-pressed to beat this. So, this isn’t technically a TV, but projectors are the best way to go if you want a theater experience—and projectors can display 4K images. The one major caveat about projectors compared to TVs is that you’ll need to be more aware of the lighting in your viewing room. It’s easier to wash out a projector screen with daylight and home lighting than it is with a modern LED TV. For more info on projectors, check out our complete projector buyers guide. For price and convenience, the TCL Roku TV is hard to beat. 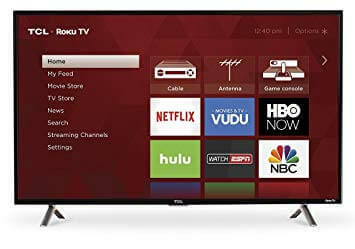 Clocking in at well under $1,000, this 55-inch TV comes with a built-in Roku streaming player, so no need to hook up an extra streaming device. It also has HDR support for killer picture quality and a built-in OTA tuner to pick up free broadcast channels—it’s a cord-cutter’s dream. The only downside is that it comes in only a 55-inch size. That might be a little small for some. Eight million pixels can’t be wrong, folks. And if it is, you don’t want to be right. Get ahead of the tech trends for 2019 and invest in 4K. While you’re at it, update your cable package as well. Without a healthy selection of HD channels, the capability of your new 4K TV will be wasted—we can help you find the best package. Just enter your zip code below to see what packages are available in your area, or check out our guide to getting the best deal on cable.